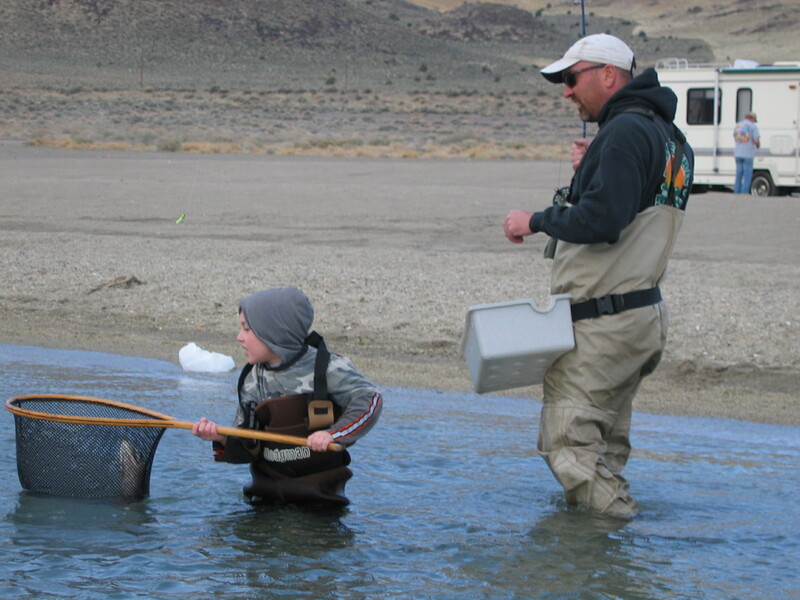 Anglers come from all over to try their hand at catching one of Pyramid Lake’s Giant Cutthroat Trout. With them they bring their knowledge, gear, techniques and skill they have learned from years of angling. Time and time again these anglers realize that every body of water is different and the techniques that work day in and day out are as well. Anglers generally use two main techniques used at Pyramid Lake with a variety of ways to fish these techniques. Most locals have two to three rods set up for fishing Pyramid and really the only thing they have to change from time to time is their flies. We have developed a couple new techniques including using Deep water Wooly Buggers and Balanced Minnows in the last couple of years so make sure you see the bottom of this page to see something new. The oldest, most productive and most popular technique for fly fishing at Pyramid Lake is fishing sinking flies right on the bottom in the sand. Over time as Pyramid Lake has receded, prevailing winds have made most of the beaches we fish very sandy. There is very little structure in the lake and for the most part it is like fishing a saltwater beach. The water gradually gets deeper as you progress out into the lake. Most anglers wade out into the lake until they get about waist deep. They cast their fly lines as far as they can and let their flies sink right to the bottom. Because there is no structure, the fish spend a lot of time roaming the beaches in search of food. So we cast our flies out, let them sink and retrieve them along the bottom in the sand to make them look like something natural swimming along the bottom. Keeping your flies on or near the bottom is very important to this method. The type of line you use is also very important to your success using this method (see shooting heads). Most anglers use a 6 to 8 foot leader, 10-15 pound test with two flies tied at least 3 feet apart. The lead fly can be tied off on a tag as well for best results (see rigging). Retrieve speeds vary from angler to angler and time of year. When the water is cold fish tend to be a little more lethargic and can prefer a slower retrieve. When the water is warmer in the spring and fall fish will tend to chase a fly moving faster. The most important thing to remember is that these fish are notorious followers and will chase your flies right to you. Inexperienced Pyramid Anglers will often pick up their fly lines and make another cast way too soon. Probably 80% of the fish you catch will be within 20 feet of you when they strike. This does not mean that all the fish are staged at your feet, sometimes they will follow your flies for 20 to 40 feet before they make the decision to grab. The general rule is to retrieve your flies until your leader is just outside your rod tip, pause and lift before making your next cast. Using an indicator on a floating line with two flies is without a doubt the most common way anglers fish nymphs and midges at Pyramid Lake. There are many variations of how to put this rig together. The basics to get you started are to use a big indicator, one that you can see and that will hold up your flies in windy, wavy conditions. A 2x-3x leader that is long enough to hang your bottom fly right off the bottom (this will vary based on the depth of water you are fishing). Make a cast out 20-40 feet in front of you and let the rig drift in the current and wind. Some important tips are: Use flies with some weight in them to keep them down (see flies), if you are using 2 flies tie them on at least 2 feet apart or even more for deeper locations and the bottom fly should hang as close to the bottom as possible without dragging. To check your depth use a pair of hemostats clamped to your bottom fly or two large split shot big enough to sink your indicator. Toss or cast out your line and see where your indicator ends up. Ideally it should sink down between 1 and two feet under the surface for correct depth. This method became popular by local area guide Rob Anderson, Some anglers would rather use their hands more while they are fishing as opposed to staring at a bobber all day. For this rig, start with a long 2x-3x leader 9-16 feet in length tied on a floating line or even better the new Rio Hover line. This line will deep your line from getting blown sideways in the wind. It is an excellent line for lots of our area stillwaters. Tie on two nymphs 3 feet apart. You can do this method with one fly but a second fly will really help to get your flies to the bottom. Make a long cast and let your flies sink all the way to the bottom. Retrieve your flies slowly to keep them on or near the bottom. Fish them all the way back to your leader just like you would with a shooting head. There are times at the lake when it is tough to fish flies right on the bottom due to grass either growing or simply laying on the bottom. Commonly anglers bring in their two fly stripping rig with clumps of grass or moss. It is during these times that we noticed anglers using a spinning rod with a Jig had a big advantage. They bounce their flies up and down off the bottom instead of dragging them directly on the bottom. In these conditions a jig fisherman can get more clean retrieves and have a better chance of putting a clean fly in front of a fish. Over the past few years we have been experimenting with how to imitate this motion with a fly rod and we have started to be successful. We have taken a Deep Water Wooly Bugger (one of our new patterns) or a size 4 Balanced Minnow and started to fish it on a floating line. the fly sinks like a rock having a large Tungsten Bead on it. the idea is to gauge how deep the water is you are fishing build a leader to match the depth and make as long of a cast as possible. The fly will sink to the bottom and if the leader is the correct length it will just start to sink the end of the floating line. Once everything is in place the stripping motion is one big quick pull. The quicker you do it the more likely the fly will be affected by the floating line and rise up from the bottom. Let the fly sink and repeat. This technique is more effective with a larger rod and line like an 8 or 9 weight. The fly line will have more buoyancy than say a 5 or 6 weight. In really deep water try using one of Rio’s Outbound Short lines with a slow sink tip (1 inch per second) but the floating line is the way to go. We recommend one of the new Rio “In Touch” series fly lines. They have a no stretch core to help with hookups.